So you’re interested in the large world of robotics, well welcome aboard! If you're a beginner who doesn’t know anything about those pesky machines or an advanced robotics expert with several degrees under their belt, it doesn’t matter, as we take anyone with a good attitude who likes biscuits. We participate in the bunfight at the beginning of the year just like other societies, which is the best place to start as you can meet us in person and we can explain what we do and answer any questions you have. If you’ve missed the bunfight or maybe missed us in the large crowds (so many people o_o) no worries, you can get in contact with us at our email: robosoc@soton.ac.uk or you can join find our Facebook page which posts all our updates and locations. That's about it, we have all the wires and bolts you could wish for, these personal items really just make things smoother for you guys. Thanks for considering getting involved with us here at Robosoc; we really enjoy working with outside companies. In the past we’ve had companies come to show presentations to us, explaining what they are doing and that they’re looking for students for graduate/placement positions. Others, we’ve teamed up with to organize tutorials teaching students how to use their software and competitions, with the goals focussed around one of their products. Companies have also sponsored us before with free parts or small donations in exchange for advertising them on the sides of our robots in competitions. 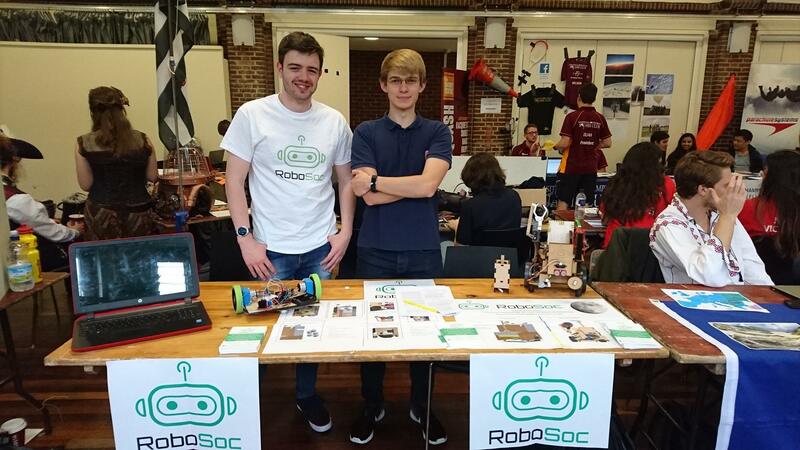 However you want to get involved we’d love to hear from you, our main form of contact is by our email at robosoc@soton.ac.uk.